Southside Woodworks is a social enterprise of Green Opportunities (GO) that builds sustainable, handcrafted wooden essentials, furniture, and custom projects. Southside Woodworks was launched in 2015 and is headquartered in Asheville’s historically African-American Southside neighborhood. Southside Woodwork’s product line features one-of-a-kind cutting boards, magnetic knife racks, and coasters, as well as outdoor furniture like picnic tables and planter boxes. Southside Woodworks is also regularly commissioned for custom projects. Our knife racks have been featured in the North Carolina Our State Store, and our unique beer caddies were selected as prizes for the 2017 Race to the Taps events. Green Opportunities’ flagship Southside Construction training program includes technical job training, life skills, career pathways, and case management to those with barriers to employment. 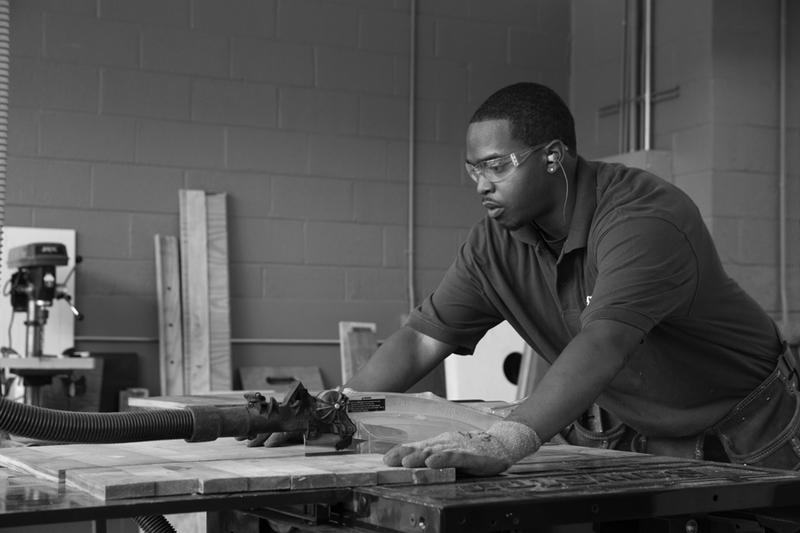 The Southside Woodworks offshoot employs students during and after their training, and was co-founded by GO graduate Eric Howell. Our goal is two-fold: to help students support themselves while they complete the training program, and help them create their own careers upon graduation. To purchase our products, please visit our Etsy Shop, or email Eric@greenopportunities.org to discuss a custom project.